Philadelphia, PA — The Wharton School of the University of Pennsylvania has announced that University of Pennsylvania alumna and Trustee Andrea Mitchell will be the featured speaker at the School’s MBA graduation in Philadelphia. 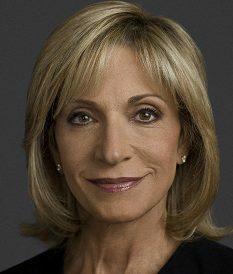 Ms. Mitchell is a veteran NBC News’ Chief Foreign Affairs Correspondent and the host of MSNBC’s “Andrea Mitchell Reports,” an hour of political news and interviews with top newsmakers that airs daily. The May 12, 2013, ceremony will occur at 1 p.m. at the Palestra, 33rd and South Streets, Philadelphia, Pa.
During her more than three decades in journalism, Ms. Mitchell has covered numerous presidential campaigns and served as NBC News’ Chief Congressional Correspondent, Chief White House Correspondent and as a frequent guest of “Meet the Press.” Currently Ms. Mitchell covers foreign policy, intelligence and national security issues for all NBC News properties. Ms. Mitchell’s extensive and varied reports include a series of exclusive interviews over the years with Cuban President Fidel Castro. Her unprecedented access resulted in a one-hour documentary on Cuba in December 2003. Throughout 2002 and 2003, Ms. Mitchell covered the United Nations debate leading up to the Iraq War. As a longtime analyst of the intelligence community, Ms. Mitchell’s past assignments for NBC News have included exclusive reports from North Korea, Afghanistan, the Middle East, Bosnia, Kosovo, Pakistan and Haiti. In September 2005, Ms. Mitchell authored “Talking Back,” a memoir about her experiences as one of the first women to cover five presidents, Congress and foreign policy. That year, Ms. Mitchell also received the prestigious Goldsmith Career Award for Excellence in Journalism from the John F. Kennedy School of Government. A native of New York, Ms. Mitchell received a B.A. degree in English literature from the University of Pennsylvania where she currently serves as a Trustee, a member of the Executive Committee and Chairman of the Annenberg School Advisory Board. She also serves on the board of the Colonial Williamsburg Foundation and is a member of the Gridiron Club. Previous Wharton MBA graduation speakers have included Connie Duckworth (WG’79), Alan Greenspan, Jon Huntsman Jr. (C’87, HON’10), Robert Kapito (W’79), Lakshmi N. Mittal (PAR’96) and Muhammad Yunus (HON’09). Information about the University of Pennsylvania’s 257th commencement ceremony is available at: www.upenn.edu/commencement. Founded in 1881 as the first collegiate business school, the Wharton School of the University of Pennsylvania is recognized globally for intellectual leadership and ongoing innovation across every major discipline of business education. With a broad global community and one of the most published business school faculties, Wharton creates economic and social value around the world. The School has 5,000 undergraduate, MBA, executive MBA, and doctoral students; more than 9,000 annual participants in executive education programs; and a powerful alumni network of 91,000 graduates.